Filing bankruptcy can only be done in federal court, and the individual states are not authorized to enact their own bankruptcy laws. The laws are thus uniform throughout the United States, with certain variations allowed to the individual states relating to what assets an individual debtor is allowed to keep ("exemptions"). There are also variations from state to state with respect to the effect of bankruptcy, because the individual states have different laws respecting the nature and extent of a debtor's property interests and other matters. 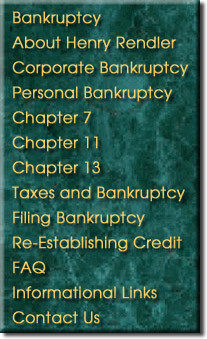 Chapters 7, 11. and 13 are the most common form of bankruptcy. Under the Bankruptcy Code, individuals, partnerships, and corporations are the only "persons" permitted to file bankruptcy.Insurance companies, banks, savings and loan associations, and credit unions are specifically prohibited from filing, and railroads are eligible only for Chapter 11 relief. To be eligible for bankruptcy filing, a person must reside or have a domicile, a place of business, or property in the United States. Chapter 13 is limited to individuals who owe less than $269,250 in unsecured debts and $807,750 in secured debts. A secured debt is one in which the creditor has taken some form of collateral (property) to "secure" the debtor's promise to pay. Common types of secured debts are home mortgages and car payments. Unsecured debts include any debt which is not secured by property, and include most credit card and department store bills, student loans, personal loans, and other such debts.